In latest anti-corruption protest in Tel Aviv, protester carries sign branding PM a traitor and a parasite. 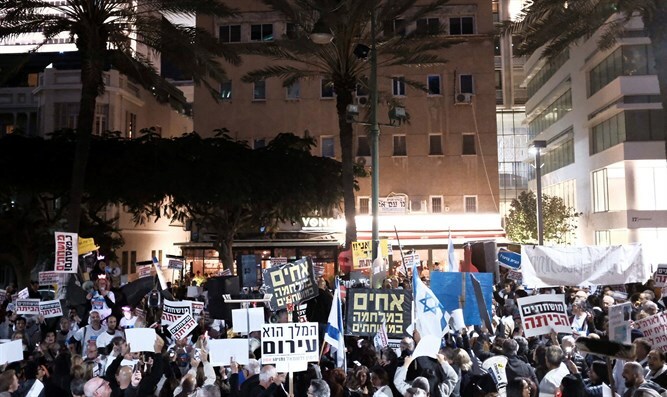 Thousands of demonstrators arrived on Saturday evening at Rothschild Boulevard in Tel Aviv to protest against Prime Minister Binyamin Netanyahu and his government. This was the fifth week that anti-corruption protests, organized by leftist elements, were held in the prestigious Tel Aviv street. One of the protesters was seen carrying a sign referring to the prime minister as “Traitoryahu” (“Bogedyahu” in Hebrew) and “Parasiteyahu” (“Tapilyahu in Hebrew). Demonstrators also carried signs which read, "An entire nation held captive by Amsalem" (a reference to coalition chairman MK David Amsalem), "The people is the sovereign", and "The corrupt should go home”. This took place one week after a protester was seen carrying a mock guillotine during an anti-corruption rally in Tel Aviv. A complaint against the display was filed with the police. "The demonstrators on Rothschild want to change the government, not through the ballot box, and along the way they are crossing red lines time and time again. The leaders of the left, Lapid and Gabbay, must stop the incitement before it is too late,” added Amsalem.